Regular bearing hybrid variety released in 2012, The trees are semi-vigorous and suitable for closer planting variety (6 m x 6 m). Fruits are attractive in shape having bright red peel and yellow – orange pulp. The red peel colour on golden yellow background makes it very appealing to the buyers. The fruit size is medium (181 g) having pulp content (71.1%). Medium total soluble solids (19.6%), rich in vitamin C (34.9 mg/100 g pulp), β-carotene content (11,474 μg/100 g pulp), it has good flavour with better shelf-life (7 to 8 days) at room temperature. Fruits are having attractive elongated shape, red peel and orange pulp. 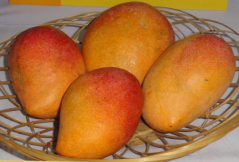 The fruit size is medium (228 g) having attractive red peel colour and higher pulp content (71.9%). It has medium total soluble solids (20.3%), rich in vitamin C (40.3 mg/100 g pulp) and β-carotene content (10,964 μg/100 g pulp), and it has good flavour with better shelf-life (7 to 8 days) at room temperature. Hybrid released in 2012. The plants are semi-dwarf and suitable for close planting (6 m x 6 m). It is suitable for both domestic as well international markets due to its attractive red peel colour, fibreless pulp, mild flavour, medium TSS, excellent sugar: acid blend and good shelf-life. 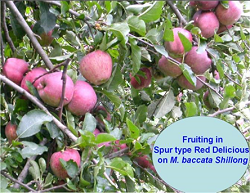 Fruits of this variety are attractive in shape and having red peel and orange pulp. 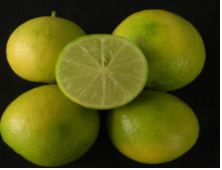 The fruit size is medium (209 g) having attractive red peel colour and higher pulp content (70.1%). It has medium total soluble solids (19.7%), rich in vitamin C (34.7 mg/100 g pulp) and good flavour with good shelf-life (5 to 6 days) at room temperature. Released in 2012, it is regular bearer and suitable for closer planting (6 m x 6 m). Fruits are having attractive oblong shape, bright yellow peel. 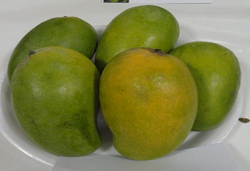 The fruit size is medium (213 g) having attractive yellow peel colour and higher juicy pulp (73.6%). It has medium total soluble solids (18.8%), rich in vitamin C (39.8 mg/100 g pulp) and good flavour with good shelf-life (5 to 6 days) at room temperature. Hybrid variety released in 2002. Regular bearer, semi-vigorous and suitable for closer planting (6 m x 6 m), ripening 1st week of August in North India. Fruits medium to large (230 to 250 g), attractive red peel; medium TSS (19.5° Brix), suitable for both domestic and international markets. It has long shelf-life (10 to 12 days) at room temperature after ripening. This variety was released in 2002. Regular beaver, Semi-vigorous and suitable for close planting (6 m x 6 m). 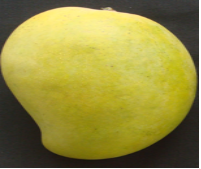 Fruit medium to large (260 to 290 g), attractive apricot.yellow peel; pulp abundant, TSS (19° Brix) with long shelf-life (10 to 12 days) at room temperature after ripening. Fruit ripens by 3rd week of July in North India. This variety was released in 1979. Tree dwarf and medium spreading. Highly suitable for high density plantation. 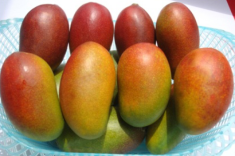 Fruit small to medium (130 g), ovate-oblong; beak indistinct, sinus slight, peel thick, light greenish yellow, flesh firm , deep orange red, fibreless. TSS (24-20°Brix), Fruit quality excellent, Maturity in 4th week of July. Released in 1979, The trees are semi-vigorous to vigorous, semi-vigorous to vigorous, moderate spreading, bearing moderately and regular. Fruit large, ovate-oblong; beak slight, sinus slight, peel thick, apricot yellow; flesh firm, fibreless. Fruit quality excellent with unique sugar acid blend. TSS (24-20°Brix), good keeping quality (15 days). It is suitable for table and canning purposes. Maturity duration : 3rd-4th week of July.